Gizmo is 11-years-old and we rescued him from the San Diego Humane Society on Tuesday, December 4th. We saw him a few weeks ago, but he needed to still be evaluated by the vet because he had just come in. Gizmo was surrendered by his owner who said she could no longer keep him. 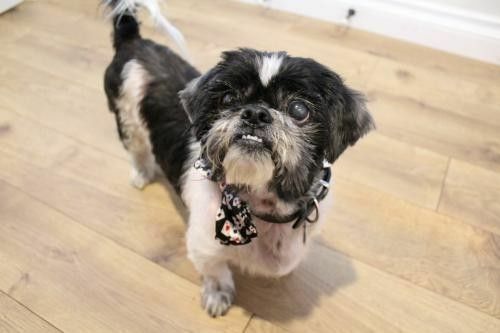 Gizmo is a little sweetheart with big googly eyes and an adorable underbite. He's looking for a home where they know the true meaning of family and will love him forever. Gizmo keeps to himself in the play yards, doesn't approach humans for pets, but if you seek him out he loves to plop on your lap and cozy up. Gizmo loves cookies and meal time, barking happily for his bowl. Giz is trying to grow his hair out so he can get a handsome shapely cut. For now his great socialization, like the fact that he loves dogs, cats, and kids, will have to be his selling points! Apply for Gizmo at https://frostedfacesfoundation.org/apply. There is no adoption fee and FFF helps with medical expenses. Not what you were looking for? You can adopt a different pet in Ramona by using our search feature and adjusting the radius. Thank you for helping our animal shelters and rescue groups with pet adoption! Frosted Faces Foundation is a 501(c)(3) non profit corporation dedicated to developing and delivering solutions to fulfill the promise of family and adequate veterinary care for senior dogs whose love and lives are in jeopardy. We require that interested applicants fill out our application. A screener follows up via email to schedule a home inspection, meanwhile calling references. Upon approval, it is required you come to Frosted Faces Foundation with all members of the family and your dogs to choose a Frosted Face. We have different programs and family types: Frosted Fling Foster Forever Foster Adoption Molly & Me Read all about them at https://frostedfacesfoundation.org/family.